Ceis Update – Quarterly Publication (Electronic Distribution) – Targets Researchers, Students doing CXC, Policy makers, Energy Specialists and the General Consume. The CEIS Update provide relevant information on energy development, news features and questions and answers for energy subjects. Click here to subscribe. Sustainable Energy and Development News (SEDN) – Monthly Publication (Electronic Distribution) – Targets all audiences and highlights relevant news in renewable energy, energy efficiency and environmental issue. 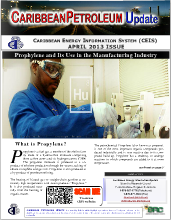 This publication is disseminated to all members and subscribers to CEIS’ network. 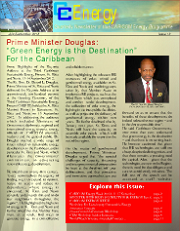 Caribbean Energy Ministers Bulleting (Cemb) – Bi-Monthly Publication (Electronic Distribution) – Targets policy makers to keep them in the know regarding developments in energy internationally and regionally. NEWEN – Provides technical statistics on renewable energy projects prior to the last ten years. Petroleum Statistics (Petstats) on CD-Rom – provides statistical data with analysis of energy imports, transformation, consumption trends with other financial and demographic indicators. To purchase click here. Provision of technical advice and Consultancy Services. Energy Research Services (e.g. 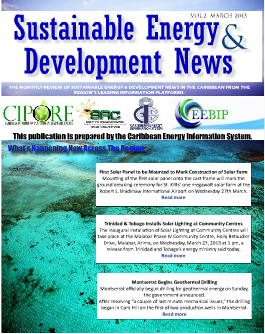 a recent study of the Impact of energy Interventions on the Caribbean energy landscape). Provision of Training of Energy Teachers (CSEC & CAPE). Provision of Advertising Services to promote energy service companies (On-line & Publications). Referrals for consultancies – allowing Caribbean nationals the opportunity to access consultancies. Database or Directory Development Services (Professionals, Organizations and Companies). Website Development Services (Energy related). Graphic Design services for Energy related promotion and marketing tools. BE IN THE KNOW by visiting our three major online platforms (CIPORE, CEEBIP and CIPPET). These platforms have been developed and are managed by the CEIS team. You may also join our Special Membership Programme. Network Membership services – Individuals or business can join the CEIS network as members and benefit form a wide range of the other services and products offered by the CEIS network. Membership packages are available for any individual or business in energy wishing to capitalize on marketing opportunities and job opportunities. See our membership packages here and join us today! 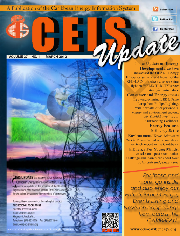 Ceis Update on CD-Roms – Summarizes past issue of CEIS Updates thereby allowing access to articles contain valuable insights on various energy topics (past & present). Directory of Caribbean Energy Professionals – creates an opportunity for Caribbean energy professionals to showcases their CVs thereby facilitating employment opportunities and possibilities for joint venture-ship with overseas investors. For more information click here or here. Directory of Caribbean Energy Organizations (Private Sector, Public Sector and NGOs) – Showcase successful initiatives, government organizations with portfolio responsibilities for energy and established private companies (suppliers, distributors, etc.) and facilitate joint venture-ship with funding agencies and potential investors. For more information click here or here. Directory of Funding Agencies and Request for Proposals -provides a central access point for information to persons who are interested in accessing funding for renewable energy and energy efficiency projects. Provides a step by step guide on how to access such funds. Creates a central access point through which all requests for proposals can be accessed and submitted. For more information click here. Database of Renewable Energy Projects In The Caribbean – showcase achievements in renewable energy in order to prevent duplication of efforts, and to learn from best practices. It also serves as an opportunity for investors to see what has taken place in the Caribbean and identify potential or scope for expansion/investments in projects. For more information click here.